Questions about Gillum's trip to New York have dogged the candidate since the primary, with his Republican opponent, former Congressman Ron DeSantis, repeatedly linking Gillum to the FBI probe. During Sunday's debate, DeSantis asked Gillum about the tickets. Gillum avoided directly answering the question. "First of all, I am a grown man," Gillum replied. "My wife and I take vacations and we pay for our own vacations … I don't take free trips from anybody. I'm a hard-working person, I know that may not fit your description of what you think people like me do, but I've worked hard for everything that I've gotten in my life." 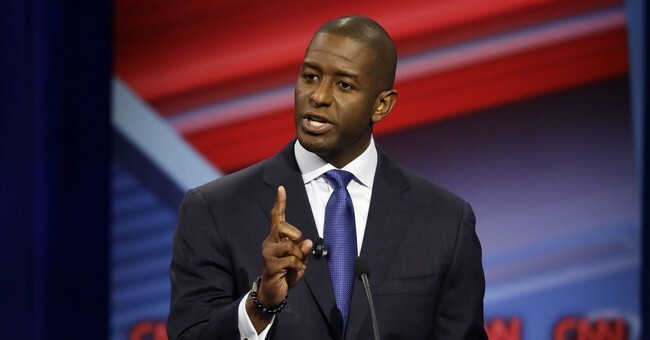 Gillum and Corey have known each other since college, and the two were friends until last year, when Gillum said he wasn't speaking to him any more. “Mike Miller and the crew have tickets for us for Hamilton tonight at 8 p.m.,” Corey texted Gillum on Aug. 10, 2016, referring to one of the two undercover FBI agents who attended the trip to New York while posing as land developers with business before the city. The ethics commission is currently probing trips Gillum took to New York and Costa Rica that were arranged by Corey. In a September 4 press release issued after the FBI investigation into corruption in Tallahassee city government came to light, Gillum’s campaign claimed he learned after the trip to New York that his brother, who also attended the trip, bought the tickets. “After the trip, Mayor Gillum learned Marcus Gillum had obtained that ticket in a swap with Adam Corey for a concert ticket,” the press release read. The race is tilting toward Gillum, who holds a slight lead over DeSantis by less than five points, but we’ll see if this has any impact. I doubt it; given how close we are to zero hour for the 2018 cycle. FBI investigations take a long time—we all know this—so don’t count on any new developments in this corruption probe to drop any time soon. But it seems dirty Gillum has been caught red-handed.